A simple 2 day vacation?? Before I begin the arduous task of packing for a two dayvacation, I figured I would take the time to write out what a mini vacationdetails for us CFers. In my opinion, I would much rather take a long vacation thana short vacation because of the amount of time which goes into packing foreither. With CF, a small weekend getawaydoesn’t mean that we can throw our clothes into a bag, bringtoothbrush/toothpaste, and deodorant and be on the road. Instead, it means we need to get our vest(airway clearance machine) packed up in its own roll along case, our nebulizermachine, our nebulizers sterilized and in plastic bags for transport, ourmedications (always bring more than two days worth..just in case) packed in abag, which means about 6 or more different pill bottles, our flutter devicepacked to go, our nasal rinse packed to go, and a backup inhaler. Oh, and I almost forgot the least-favoritepart. At the last minute (I HATE lastminute..too afraid I will forget it), we have to pack our refrigeratedmedicines in a cooling case for the duration of the trip. In addition, I also have to bring a babybottle sterilizer so that my nebulizers can be sterilized every day while I’maway. All this for a two day trip. As you can imagine, I prefer lengthy vacations because Ineed to pack the exact same items, just in larger quantities, and then packingall of it up seems worth it. For aweekend getaway, it seems crazy. Plus,even with family, I always get the comments such as, “WOW! You packed for amonth!” or something similar. When we look at our luggage, over half of it is always medications and CF related items. 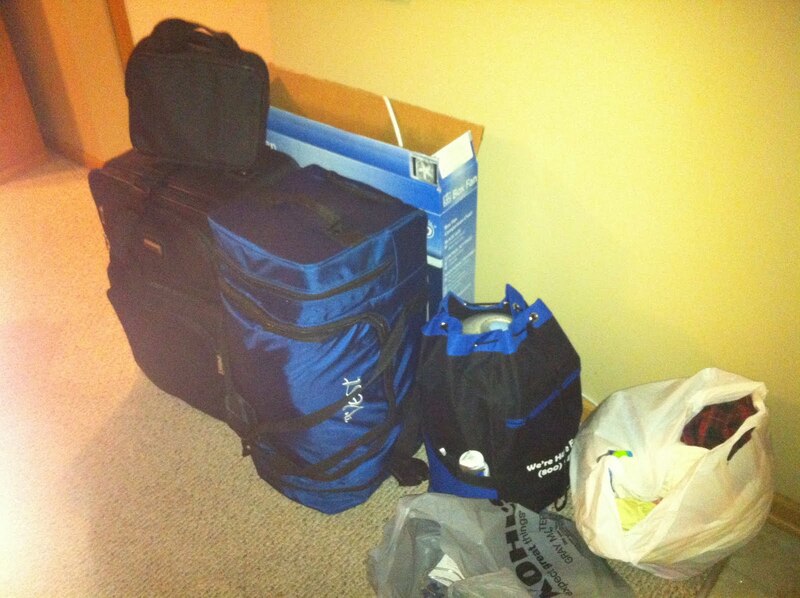 Here it is – two days worth of packing. Even the suitcaseto the far left is half-filled with medications. Needless to say, it takes awhile to pack. I hope everyone has a safe and wonderful labor day weekend! !I’ll probably post when I get back! Thank you so much! It was a wonderful little get away! Exactly what we both needed.